Hot tubs are not just good to use when the weather is warm; they can also be used in cold climates. There is nothing better than stepping into a hot tub when the temperature is freezing outside. The hot water against your body will help you feel very relaxed and comfortable. All your friends and family members will want to come over, so they can warm themselves up in your hot tub. Even though using a hot tub in a cold climate is great, there are certain considerations you should think about. If your hot tub comes with a freeze protect system or auto heat, be sure to activate it when temperatures start to drop at night. This will make sure the water and jet piping do not freeze in the middle of the night. If your hot tub does not have these features, you have to keep your hot tub running on low speed heat mode for 24 hours a day. Letting your water get too cold will not only cause it to freeze; but it will also cost you a lot of money in energy bills. This is because it will take a lot of energy to heat it up from a very cold temperature to a very warm temperature. Make sure to maintain your water temperature on a regular basis to keep these things from happening. 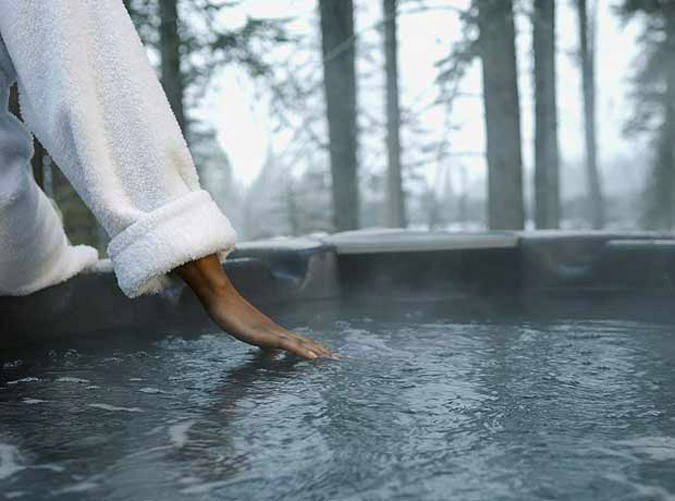 Draining your spa will definitely be a hassle when it is freezing outside. That is why it is important to drain your spa in December when the weather is somewhat mild. If you do it this way, you will not have to drain your hot tub again until the beginning of March. A hot tub cover not only will prevent dirt and leaves from getting in your hot tub; it will also regulate the heat in your hot tub and reduce your energy bill. When you are done using your hot tub, make sure to put a hot tub cover over it. You will be amazed at how much lower your energy bill will be in the winter. If you are still trying to find a hot tub cover for your hot tub, you should definitely order one from the Cover Guy. The Cover Guy provides the best quality hot tub covers at affordable prices. These hot tub covers are specifically made for colder climates. The covers come in many colors, shapes and sizes, so you are sure to find one that is right for your hot tub. You can build your own cover on their website and have it delivered to your home within several business days. The Cover Guy also provides high-quality hot tub cover lifters that help you remove and store your hot tub cover. These hot tub cover lifters are affordable and easy to use.